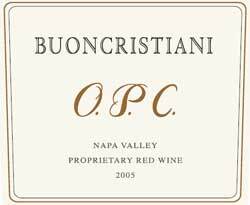 Buoncristiani Family Winery was established in 1999 by four young brothers who were born and raised in Napa. The brothers honed their winemaking and viticultural skills in some of Napa's top wineries and have since been producing highly sought after wines. In their quest for excellence, they focus on sourcing only the best fruit possible from some of Napa Valley's finest vineyard blocks, including Stagecoach and Hyde Vineyards. The four Buoncristiani Brothers are bonded not only by blood, but also by a shared passion, vision, and dedication for handcrafting ultra premium wines. At the core of their handcrafted portfolio are extremely limited offerings of Napa Valley Cabernet Sauvignon and Chardonnay as well as their Proprietary Napa Valley Red Blend - O.P.C. To join the wine club, visit www.buonwine.com or call 707-259-1681.